VOCAs (Voice Output Communication Aids) produce spoken words, either synthesised or pre-recorded, which are selected by the user from a stored vocabulary of words and phrases. The vocabulary can be accessed in different ways, depending on physical and cognitive abilities. Developments in this area have been very rapid, opening up wonderful new possibilities for people who are unable to communicate with speech alone. Initially developed for children with autism, and now being used by a wide range of individuals who are non-verbal for various reasons, this portable unit enables them to select pre-recorded words and phrases which are identified by pictures, words or symbols, place them on one of the five buttons on the device, and press to playback. The ProxTalker has proved to be reliable and simple to use, with one of its key advantages being portability – it can be carried around easily in its own backpack or mounted on a wheelchair. Whatever system is chosen, the ultimate success will depend in great measure on training and practice. It is not just the individuals using the communication aids, but also those around them who need to become familiar with how it works. 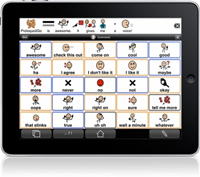 The increasing prevalence of tablet computers and smart phones – and the many apps to go with them – is changing the landscape in AAC for literate adults who have lost speech, and are able to use a touch screen for input. An iPad or iPhone with one of the assistive apps is a cheaper option than a dedicated AAC device, and from user accounts, seems to do as good a job. Shown here, an iPad with ProLoQuo2Go software, which can be customised to suit the user, providing a communication package for around £500. For a detailed and informative first-hand account of using technology to overcome communication problems, I recommend reading Kati’s blog. Of course, dedicated AAC devices can be essential for those individuals who rely on alternative interfaces, such as eye gaze systems. These detect eye movements, allowing you to control a computer for communication – and indeed for environmental control – without bodily movement or contact with the device. A new wearable eye tracker device, EyeControl, has recently been developed, which is powered by artificial intelligence, and doesn’t require a screen to function. Use this form to send an email about High-Tech Communication Aids to Independent Living. Your contact details will be held securely, so that we can reply to you and deal with your query.